Mattapoisett Boatyard, located on scenic Mattapoisett Harbor, is a complete service facility with a friendly, informal atmosphere. Previously Burr Brothers Boats, we have been family owned and operated since 1962. We are the only true waterfront Yard in the harbor making this one of the most convenient places to store and moor your boat. Plus, our facility is far away from the Cape Cod traffic, about one hour driving distance from the greater Boston area. 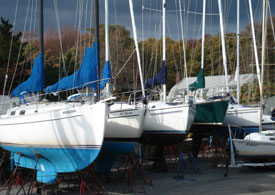 Mattapoisett Boatyard provides all aspects of service and repairs to most types and sizes of recreational watercraft, from daysailers to 50' motoryachts. Our highly skilled and formally trained technicians are ready to tackle anything from basic maintenance and repair to extensive fiberglass work. We pride ourselves on getting the job done quickly and efficiently and in the most professional manner possible. All of our work is guaranteed to meet (and usually) exceed your expectations! Our estimates are fair and we stick to them. Visit our Marinas.com profile for even more information and photos.